Shinih Enterprise originally created our patented product "Vertical Folding Technology" (VFT). After running a series of tests on our VFT products, VFT’s strength support and comfort greatly surpasses other similar products. Vertical Folding Technology is a patent product which makes the fiber stand vertically through innovative technology. Its fiber arrangements are similar to the vertical wave stand; the vertical support increases greatly from the vertical standing fibers. While our VFT products’ downy surfaces provide extreme comfort, our innovative manufacturing process our product reduces the use of raw material. 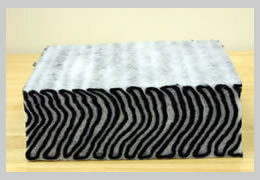 VFT’s three dimensional construction also provides better air and water permeability. At present, VFT has received patent rights in 20 countries worldwide. It has also received the Eighth Honorary Invention Award from the Republic of China, Taiwan. VFT patented products have become Shinih Enterprise's pride. Shinih Enterprise has increased VFT production lines to support our sales expansion. We believed VFT will continue being a winning product in the leading market . It will provide our customers happier and more comfortable lives.